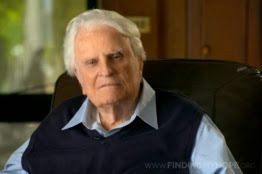 JuanaMikels.com: Billy Graham turns 95 today. Watch His Last Message to the Nation TONIGHT Online or on TV! Billy Graham turns 95 today. Watch His Last Message to the Nation TONIGHT Online or on TV! Billy Graham turns 95 today and gives tonight what he describes as what "well may well be my last message to our nation. I have prayed a great deal about this." You can find out where you can hear the message tonight, in the next few days, on your tv or online, by clicking here. Reverend Graham has counseled many presidents over this lifetime, and is spending his last years at his family home in North Carolina. "With all my heart, I want to remind Americans of God's amazing love and, as simply and clearly as I can, call people to 'a repentance that leads to salvation' (2 Corinthians 7:10, ESV)." Happy 95th Birthday to Reverend Billy Graham today! Call or send this to someone you know who needs salvation found only in the cross, or a Christian friend on your heart that would be encouraged in their faith in Christ by listening to what most likely will be this great man of God's last message to the nation.